WebCanDo Blog: Can the Palm Pre beat the Iphone? Can the Palm Pre beat the Iphone? The Palm Pre is an internet-connected multimedia smart phone designed and marketed by Palm, Inc. with a multi-touch screen and a sliding keyboard and CPU that rivals a small netbook. 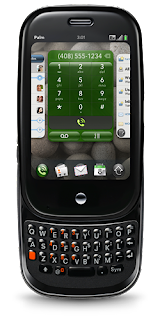 The phone is scheduled for release in the first half of 2009 and is the first phone to make use of the palm webOS — a Linux-based operating system developed by Palm. The Pre functions as a camera phone, a portable media player, a GPS system, and Internet client (with text messaging, email, web browsing, and local Wi-Fi connectivity). The Palm Pre was debuted at the 2009 Consumer Electronics Show. It is the first mobile phone to use Texas Instruments OMAP 3430 processor. The Pre will initially be available exclusively through the Sprint CDMA network in the United States. However, an unlocked 3G UMTS/GSM version of the Pre will also be available for other markets. The Palm Pre has also attracted simultaneous praise and criticism due to a few similar features previously exclusive to Apple's iPhone, not only with its physical design, but with certain aspects of its user interface. It has been speculated that a patent cross-licensing agreement may be forged over many of the touch features of the Palm Pre since Apple has also incorporated features previously patented by Palm in the iPhone, an impending court battle may be the result. The Palm Pre was a major winner of three of CNET's Best of CES Awards 2009: Best in Show, Best in Category: Cell Phones & Smartphones and People's Voice. The Palm Pre features an ARM OMAP3430 microprocessor, featuring a 600 MHz ARM Cortex A8 CPU, PowerVR SGX 530 GPU, 430MHz C64x+ DSP + ISP (Image Signal Processor), the fastest of most phones available today. The phone comes with 8GB of internal memory, a 3 megapixel camera with LED Flash, Bluetooth, Wifi 802.11b/g with WPA and WPA2, and Removable Battery. The Pre will be one of the first smartphones to feature wireless charging through a first of its kind; electromagnetic induction and the use of an optional wireless charging dock, dubbed the "Touchstone". A special Palm Pre wireless charging back cover will also necessary in order to utilize the device. The Pre has connected calendars and contacts and uses the Palm Synergy feature to bring your Outlook, Google, and Facebook calendars together for one logical view of your day. And if you have the same contacts in different places, Pre can link them together, making it easy to find the information you need. The Pre will keep multiple applications open and move easily between email, maps, photos, and websites. Pre arranges your applications as "activity cards," and lets you flip through them, move them around, or throw them off screen. Notifications will no longer interupt your calls, as text messages and calendar appointments appear as notifications at the bottom of the screen. You’ll know what’s going on without being completely interrupted or losing your train of thought. Web applications and search are incredibly fast due to the IE6 browser bringing you full websites the way they were meant to be seen, including Flash based content. Search by typing your contacts, applications, Google, or even Wikipedia. Universal search narrows down the possible results as you type, so it’s easier to find what you need. Overall the design is a breakthrough design and slide out the keyboard for faster and easier texting a major advantage from the Iphone. Close it up and rotate Pre for music, websites, photos, and videos in full widescreen glory. You get the best of both worlds in one beautifully designed phone. * POP3/IMAP (Yahoo, Gmail, AOL, etc). Overall, the Palm Pre looks like the best contender to the Iphone, hands down. We can only wait and see. Palm has bet the farm on this phone, so if the Pre flops Palm will be next company on the short list.